There are some interesting animations with the Queen and Jack of Hearts. The Queen is reclining on her throne showing a lot of leg. The Jack quickly eats up the tart in his hand. Light background music plays throughout the main game and this gets livelier during the free spins. 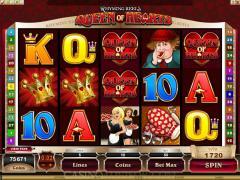 Queen of Hearts is a Microgaming video slot. It has 30 paylines and players can wager up to 10 coins per payline. There are three coin denomination options, which are 0.01, 0.02 and 0.05. Together these betting options combine to give a maximum total bet of 300 coins or 15.00 credits. The highest fixed jackpot is 4000 coins. At maximum bet this will pay out 40,000 coins or 2000.00 credits. Players should opt to play in the Expert Mode because it is more convenient to set the betting parameters. The Queen of Hearts Logo is the wild symbol. 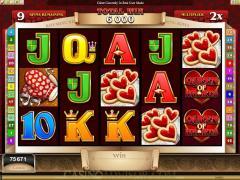 It offers the highest fixed jackpot and also doubles payouts when in winning combination with other symbols. Two or more Crown symbols appearing anywhere on the reels offer scatter payouts. As far as game features are concerned there is only the free spins bonus round. There is no bonus game on the second screen or gamble game. 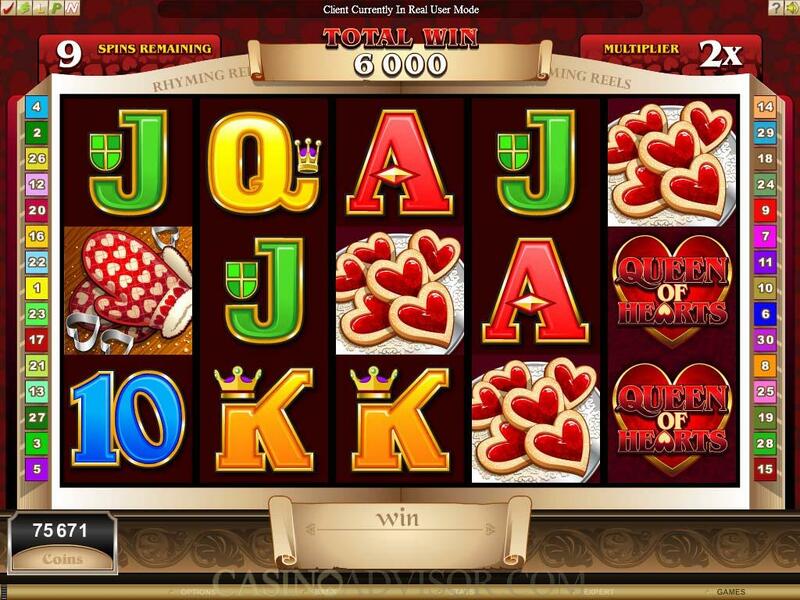 The free spins round is triggered when three or more Crown symbols appear scattered on the reels. 10 free spins are awarded in all cases. The free spins double payouts and if winning combinations are made with the wild symbol then the payouts are quadrupled because the wild symbol independently doubles payouts. During the free spins the wild symbol can appear stacked on reels and if this happens on the first reel then payout possibilities are greater. The maximum payout possible during the free spins bonus round is 2,400,000 coins. 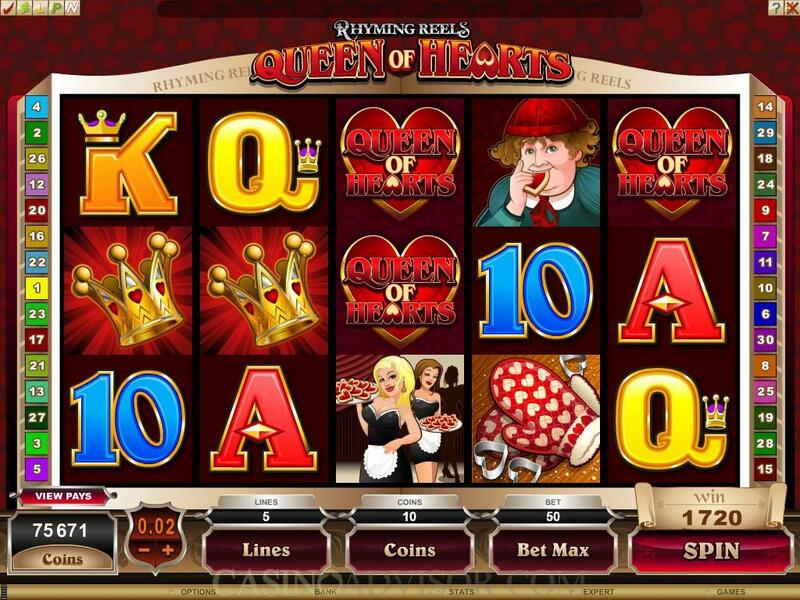 The complete range of Microgaming customization options is available in Rhyming Reels Queen of Hearts. Players can enable or disable various sound options independently. Players who want to wager at a fast pace can enable the Quick Spin option. A variety of statistics are available to the player to help him keep track of the wagering, though most players do not use the statistics in slots games. The best feature is the Auto Play. Players can activate 5 or 10 auto spins directly. For a larger number of auto spins players have to use the set up menu. Interested in reading more detailed information about Queen of Hearts? If so Click Here for more details.